With the 113th Congress now in the history books, we conducted a final tally of our nation’s legislative productivity — in terms of both total laws passed and of substance. Our calculation finds that the 113th just barely avoided the dubious title of “least productive Congress in modern history.” But that’s only because of an exceptionally active lame duck session. 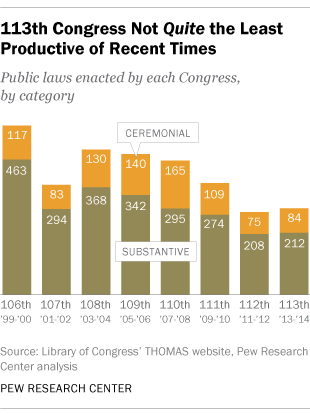 In all, the expiring Congress enacted 296 laws, 13 more than the 2011-12 Congress. Of those, we categorized 212 as substantive by our deliberately generous criteria (that is, anything besides building renamings, commemorative-coin issuances and other purely ceremonial laws); that was four more than the previous Congress. One might not have predicted such a finish. When Congress broke for its election recess, it had passed just 185 laws, putting it on pace to be the least-productive in recent history. In fact, we expressed some skepticism that lawmakers would end the year with a burst of activity. But we were wrong: The 111 measures passed in the lame duck session (which lasted just over a month) accounted for well over a third (37.5%) of the 113th Congress’ entire legislative output — continuing a trend of more and more business being put off till after election season. That business included passing a $1.1 trillion spending bill that avoided another government shutdown, extending several dozen expiring tax breaks, and enacting a massive defense-policy bill that does everything from authorizing U.S. aid to forces fighting the Islamic State to extending the deadline for establishing a memorial to President John Adams. To be sure, Congress was busy with the ceremonial stuff, too. Lawmakers made sure to award a gold medal to Jack Nicklaus and confer honorary citizenship on Revolutionary War hero Bernardo de Galvez y Madrid before leaving town for the holidays. We classified 71 of the 111 laws passed during the lame duck session as substantive, or 64% — the lowest such percentage among the past eight Congresses. The most productive Congressional lame duck session, by the way, was the 107th Congress in 2001-02. As the nation was moving toward war against Saddam Hussein’s Iraq and continuing to grapple with the aftermath of the Sept. 11 terrorist attacks, all but one of the 84 laws passed during that time were substantive, including the creation of the Homeland Security Department. How productive are lame duck Congresses?